If you're looking for a quality pillow that will help you sleep comfortably night after night, check out the 'Fresh Pillow' from PangeaBed™. This great pillow provides the feel of down without the feathers. Impossible? I thought so too until I tried it for myself! I'm all about finding ways to get better sleep, so it made me really happy when the team at PangeaBed™ asked if they could send me a Fresh pillow to check out for review purposes. I have used several memory foam pillows over the years and have enjoyed them, but this one is truly outstanding. This pillow is actually made with a unique "combination of shredded Talalay Latex and gel infused memory foam." So, it offers all the benefits of memory foam (sturdy, long-lasting, provides great support for your head and neck, etc.) with the luxurious feel of down (without the feathers). This hypoallergenic and microbial pillow is a particularly great option for people who have down allergies, as well as those who are allergic to mold and dust mites. Of course, it's also a great choice for others as well. When the pillow arrives, it doesn't look like much. But, you shouldn't be deceived by this. The pillow is compressed for shipping (yet another benefit of memory foam), but will expand to its full size (which I find to be just right) within an hour. It will more than double in size upon sitting for a bit, and fits perfectly in a standard pillow case. The pillow is a traditional oblong shape and is quite fluffy, as it is stuffed with four pounds of fill (1.5 pounds of Talalay Latex and 2.5 poinds of gel-infused memory foam). The pillow's dimensions are approximately 26" x 16" x 7". To me, this is the perfect size. I don't like king size pillows and often find other pillows to be too thick or too flat. This one is just the right thickness. This pillow is made in the United States and seems to be very well-made. It is stitched securely and the fabric covering seems to be sturdy even though it feels soft to the touch. PangeaBed backs up the quality of the pillow with a full one-year warranty. It is also designed with safety and purity in mind. 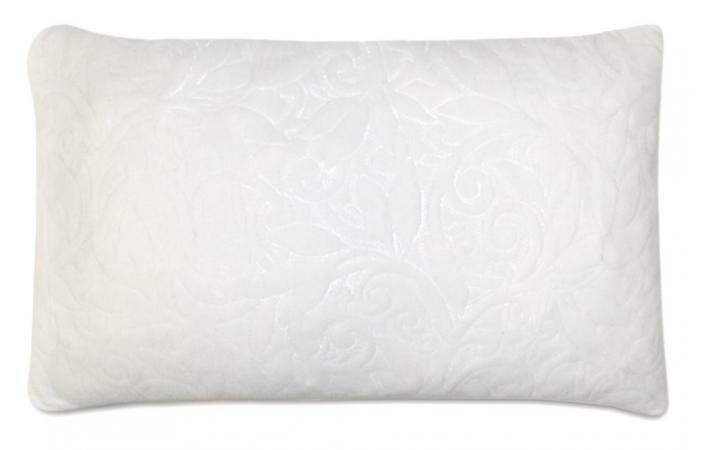 The Talalay Latex used in this pillow is OEKO-TEX® Standard 100 certified, which means that it has been tested to ensure that it does not contain substances that may be harmful. Additionally, the pillows themselves have a purity certification - they are certified through the CertiPUR-US® program, which verifies that they are not made with a wide variety of harmful substances, such as ozone depleters, formaldehyde, chlorofluorocarbons (CFCs), heavy metals, and more. Does this sound like a pillow you might love? At $99, it's not the cheapest pillow out there. But, I do feel that it is one of the best. And, really, this is a small price to pay for getting a pillow that you'll love. When I think of all the money I have wasted buying pillows that cost about half this amount that I end up hating (there are two in my closet right now), this one seems like a bargain. Plus, you won't be stuck with it if, for some reason, you don't love it. PangeaBed is so certain that people will love this pillow that they actually offer a 60-night in-home trial. You can try the pillow in your home for 60 days with no risk. If you don't love it, you can send it back - no questions asked. You don't even have to pay for shipping. There are no shipping fees when you purchase, and you won't have to pay for return shipping if you decide it needs to go back. I'll bet that you decide to keep it, though. This is one comfortable pillow!